Lighting Our World With a Year of Celebrations by Lighting Our World With a Year of Celebrations. Review: The holidays Las Fallas, Carnival, Holi and Walpurgis Night are just some of the holidays read about in Catherine Rondia's book Lighting Our World A Year of Celebrations. Lighting Our World A Year of Celebrations has some interesting details about different holidays that countries celebrate. For example in India the Hindus celebrate a holiday called Diwali. The festival during Diwali honors Lakshmi, the goddess of wealth, luck and happiness. They use special decorations to invite Lakshmi into their homes. They put candles around their shops and temples. Hindus believe that Lakshmi will visit the house with the brightest lights. A visit from her means good luck for the whole year. Overall Lighting our World A Year of Celebrations is an engaging way to demonstrate holidays from countries around the world. 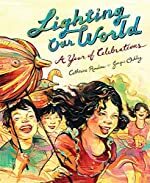 Lighting our World A Year of Celebrations by Catherine Rondia and illustrated by Jacqui Oakley has great detail in the words and illustrations featured in the book. Rondia shares information, which is not boring, but instead in a way that is fun to read. Also she provides important details what she writes about the holidays. Oakley illustrations powerfully represent the holidays that are featured in Lighting our World A Year of Celebrations. Also her illustrations make the reader feel as if they are celebrating these holidays. This book is an easy read and is about 30 pages. It would not only be interesting for readers, but it would be a good resource book for students. In conclusion, I enjoyed Lighting Our World, which would also be appreciated by all ages. We would like to thank Raab Associates for providing a copy of Lighting Our World With a Year of Celebrations for this review. Have you read Lighting Our World With a Year of Celebrations? How would you rate it?